Plein air painting is not exactly a walk in the park. 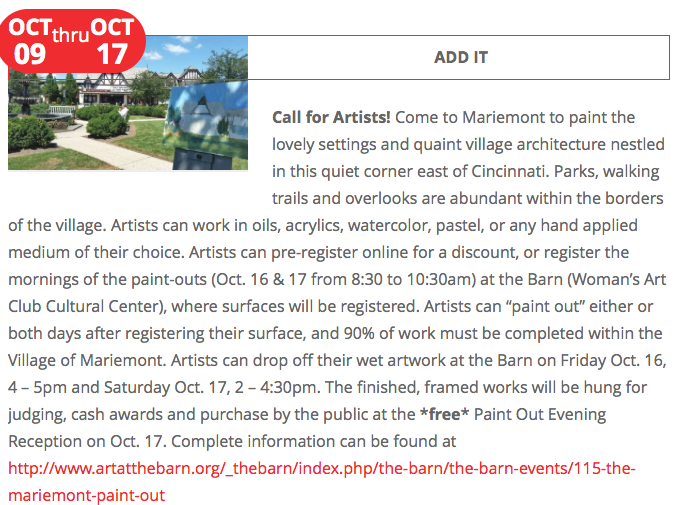 That was my lesson from last weekend, when I participated in the first annual Mariemont Paint-Out. I've never done plein air painting before, but I adore our neighborhood, Mariemont, so I decided to give it a try. Specialized plein air easels exist, but I don't have one... my setup probably looked ridiculous! I painted for 2 hours on Friday morning, then returned at 8:30 Saturday morning to give it another go. Took a break mid-day. Altogether, probably spent 7 hours on this? I realize now that I looked like a crazy person. Oh well. Here's my finished piece! I love how thick and juicy the paint got while I was trying to work in some fast layers. It was still wet when I photographed this, so please forgive the glare. Plein air painting was a new kind of challenge for me. It really changes the way you perceive your subject. I'd love to exercise that technique more in the future!